The Good Luck Cliffs trail in late April. The first thing you should always do before hiking at any time of year is research. It's important to know what you're getting yourself into before you hit the trail, especially when conditions can vary drastically week to week. At a minimum, be sure to check the state Department of Environmental Conservation trail conditions and the weather. And remember that the weather often changes by elevation. The National Weather Service's Mountain Point forecast is excellent if you're planning to hike in the Adirondacks. 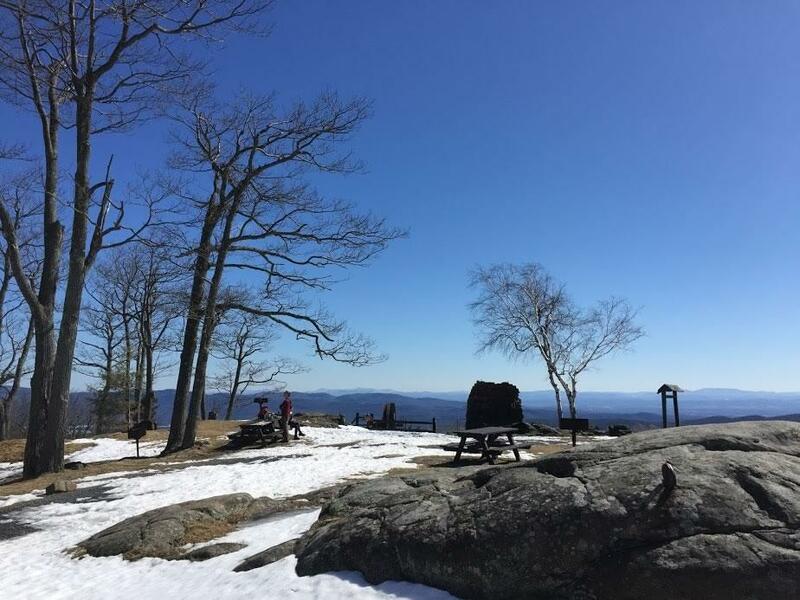 It provides weather information for a handful of summits -- and if you're unfamiliar, you might be shocked to see how different the weather can be from Albany. One night last week, for example, the windchill low was 25 degrees in Albany... and -26 degress on Whiteface -- a 50-degree difference. Winter weather persists much later in the year in higher elevations. I've encountered snow on a high peak in June, while it was 70 degrees in Troy. No matter what the forecast says, be prepared for a variety of conditions. Even if the forecast calls for sunny, mild weather, bring more layers than you think you could conceivably need. Summits are often windy, and you'll be miserable if you don't bring any extra clothing. Merino wool or synthetic is best. 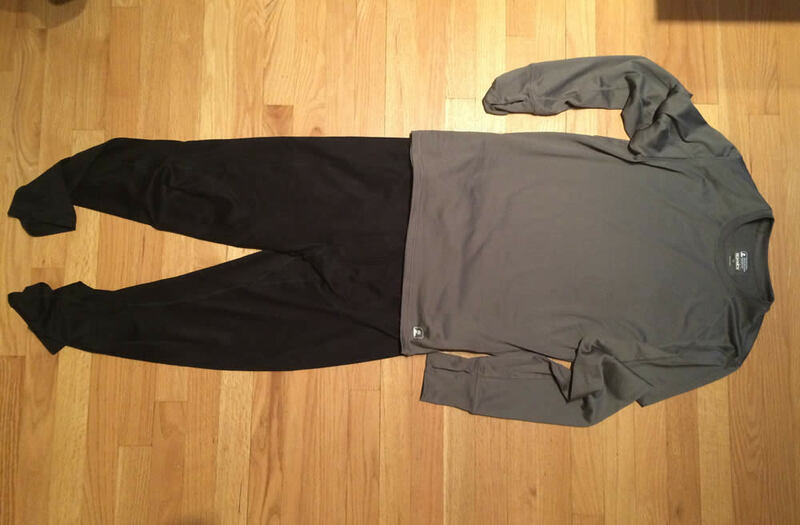 Something like Uniqlo heattech is a good place to start. Avoid cotton as a base layer, as it holds moisture in. A regular long sleeve shirt you'd wear to work out in is sufficient, and try to stay away from cotton if you can (again, because of moisture). If you're looking for something a little more technical, try a shirt like this EMS Techwick pullover. If it's cold out, add a second mid-weight layer. If the forecast calls for warmer weather you can probably leave the parka behind, but you still need to bring a jacket. Even if you're warm enough without it while walking, when you stop for a snack break or hang out at the summit, you'll cool off quickly and wish you had it. Depending on the weather and what you already own, a fleece jacket may be sufficient, or a lightweight puffer. If you need a new jacket, a decent softshell, like this one from Outdoor Research, is a good investment. You should also bring a rain jacket in your pack, just in case. Usually one layer of pants is enough this time of year, but if it's going to be especially windy or wet, add a base layer. Prana pants are the gold standard of hiking pants, and well worth it if you plan to hike a lot. Wool socks are good for hiking any time of year, and in the spring be sure to bring an extra pair in case you end up with a wet foot. Smartwool hiking socks are a popular option. It's spring, the snow is melting. That means the trail will be wet. If you only wear regular gym sneakers, you're going to have a bad time. So wear boots or similar footwear that's waterproof (look for Gortex as one of the materials). Trust me, there's nothing worse than hiking down a mountain with soggy feet squishing every step. Boots are best bought in person, so you can try a bunch on. Locally, L.L.Bean and EMS have a stock a variety of options, as well as Mountainman in Saratoga. 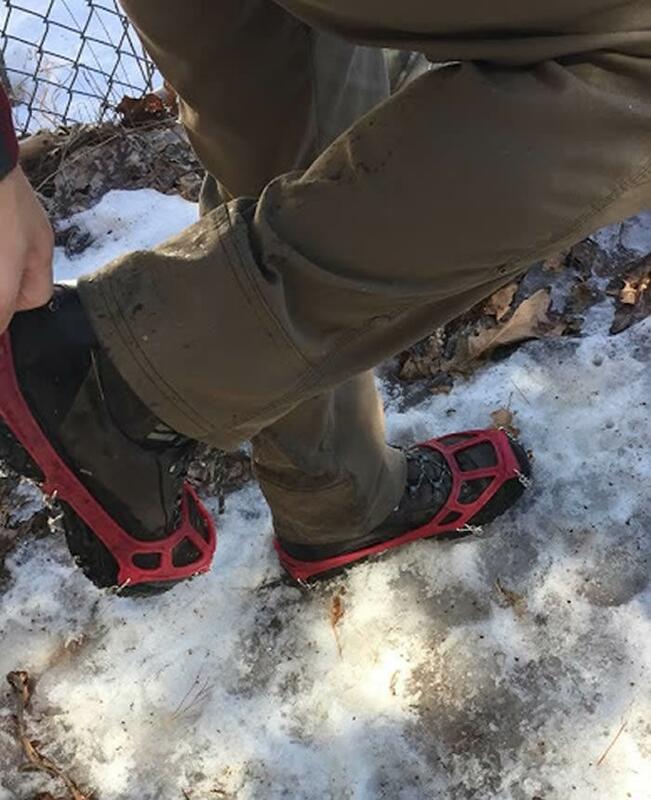 Essential for icy spring hiking, these will keep you from sliding around on the slushy remains of winter on the trail. You might be able to struggle up the mountain without them, but having a pair will make hiking on icy terrain drastically more manageable. Also note, microspikes are not the same as YakTrax, which are designed for your driveway or sidewalk, not a mountain. Be sure to get a pair that look like the Katoolahs. If you're heading far north, or to one of the High Peaks, you should still bring the snowshoes along for a few more weeks. Any time there's more than a couple inches of snow, they're essential. 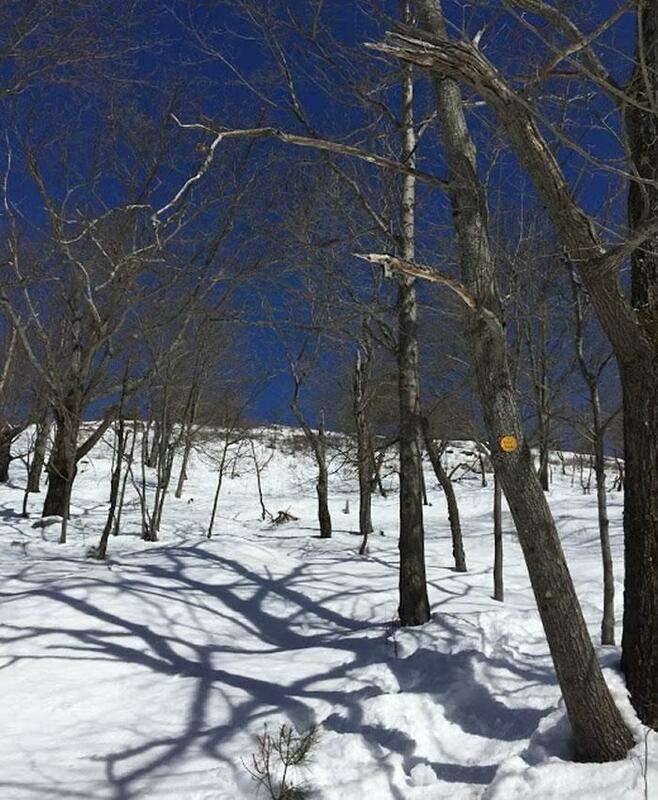 In the lower elevations you may not need them, but be prepared to turn around if the snow gets deep on the trail. Stay on the trails, even if they're muddy. This is part of why it's important to have waterproof boots. When the snow melts and the trail is muddy --or it literally has running water -- you should slog right through it, not go around. Yes, those little paths around the muddy section are tempting, but doing so contributes to erosion. On popular trails that can quickly become a significant problem. Additionally, in places like the High Peaks, there is often fragile alpine vegetation off the path, and stepping on it will kill it. It's important to preserve these and other plants by not trampling them. 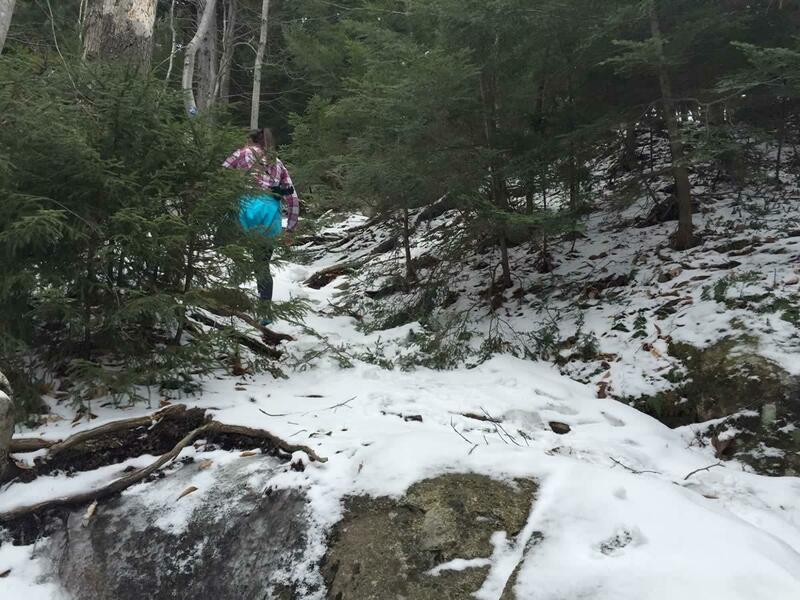 The Buck Mountain trail in Lake George in late March. The moment you realize you are unprepared -- for example, you see the trail is icy and you don't have microspikes -- turn around. It's better to make this call right away and not risk injury. Even though it's a bummer to miss out on a hike you had planned, it's much better than the alternative of forging ahead unprepared. It's worth repeating. Even when the forecast says 45 and sunny, bring a hat and gloves. And an extra top layer. And extra socks. Is it a pain to carry the extra weigh up the mountain? Yes. But if you are injured or lost, you'll be glad you have the extra clothing. While moving, you'll be warm, but if you stop for a prolonged period of time, you'll get cold quickly. If the forecast calls for inclement weather, it's a good idea to say home. The DEC also issues a mud advisory sometime around May of each year for the High Peaks. They ask people not to hike there during mud season because it severely erodes trails. So even if you're anxious to get out and hike the big mountains, be considerate and stay off the trails once the mud advisory is issued, so that the trails can be maintained for the future. If you're ready to hit the trails, consider one of these hikes. 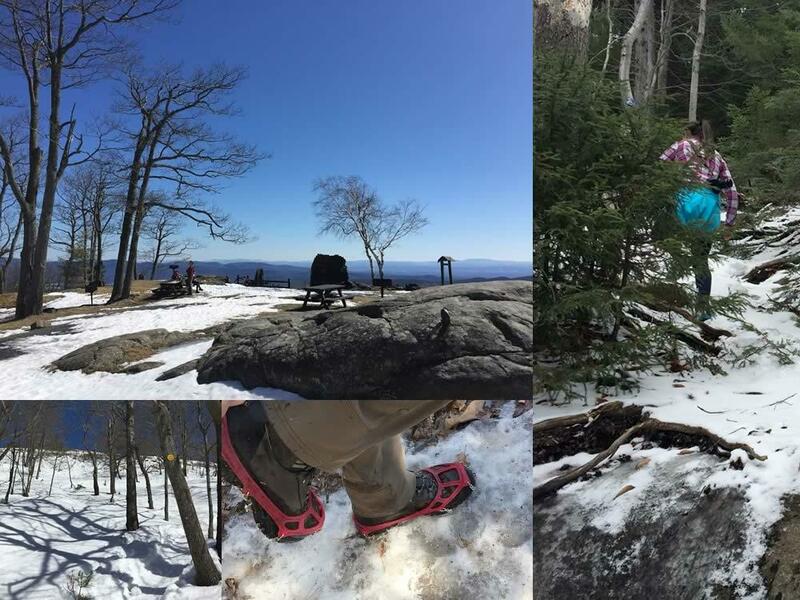 A short, steep hike with a fantastic view at the top, Prospect Mountain is very popular. It's right near Lake George village, and in the summer it can be extremely crowded. This time of year, it's still pleasantly empty, the tourist hordes yet to arrive. The mountain is unique in that there's a seasonal road to the top, which won't be open until Memorial Day. Because the mountain is so popular in the summer, there are a bunch of picnic tables at the top, making for a very civilized hiking picnic. Venturing south of Albany instead of north, can result in some friendlier weather than the Adirondacks. The Overlook Mountain hike winds up an old carriage road, and while steep, it's a wide, even trail. At the top, you can explore the ruins of a never-finished hotel, and read the story of the doomed Overlook Hotel. There's also a fire tower to climb for even better views. This is an incredibly popular hike in the summer, so heading up in shoulder season will avoid some of the crowds. Good Luck Cliffs in late April. 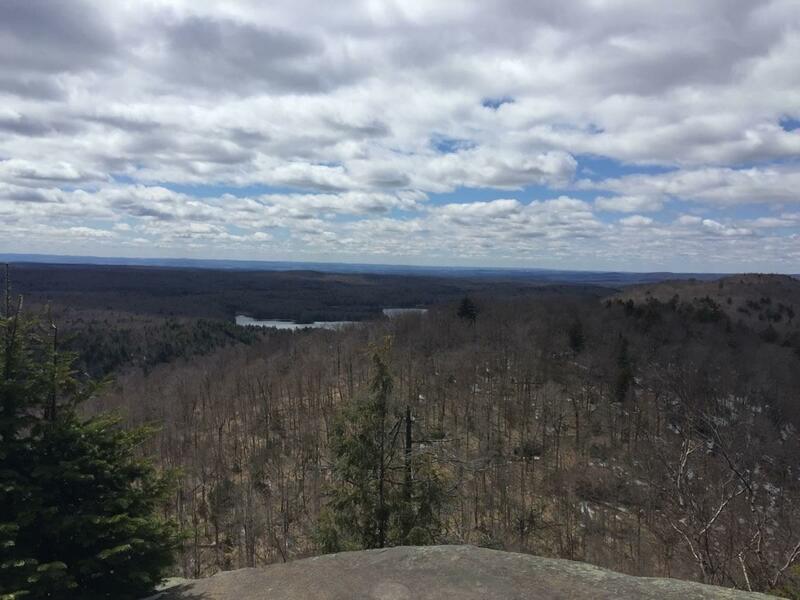 A hidden gem in the southern Adirondacks, Good Luck Cliffs offers spectacular views without the crowds of Prospect and Overlook. The climb is challenging but not too long, and you'll pass boulders, caves, and creeks on your way to the top. The path to the cliffs was unofficial until recent years when trail markers were added. As a reward for the rugged climb to the top, you'll be treated to sweeping views of surrounding lakes and mountains. And it's worth repeating: Any time you're hiking, you should be be prepared with proper footwear, clothing, gear, and water. 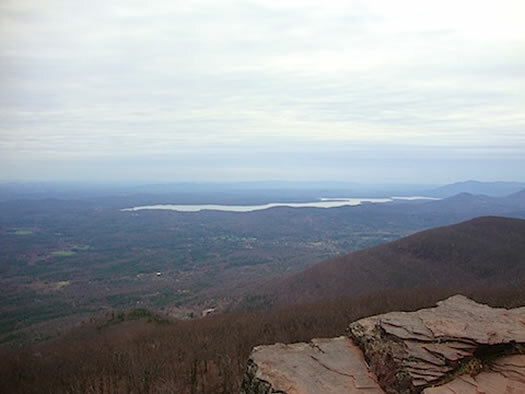 Check the weather forecasts and trail advisories for the area you'll be hiking. And practice proper trail etiquette, including leave no trace. This article is no substitute for a map or guidebook. Thanks for this post. Hooray for early spring!